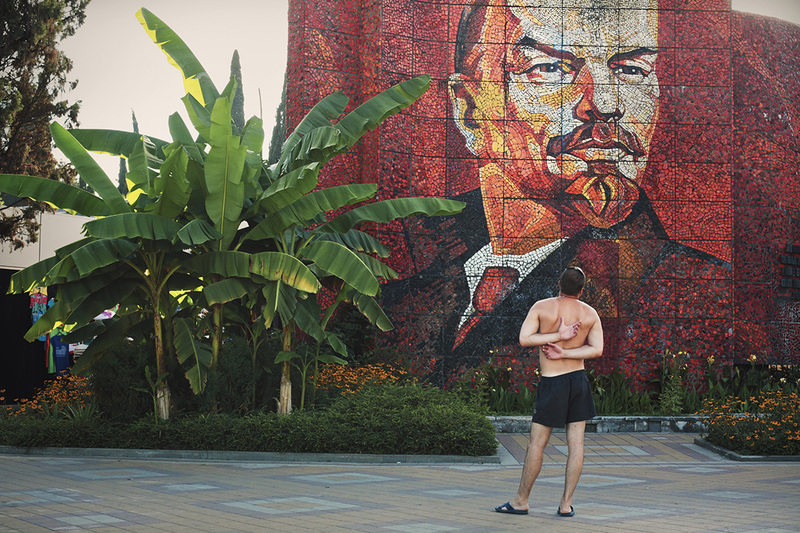 Mosaic of Vladimir Lenin in Sochi. The tradition of mosaic storytelling goes back to antique times and religious themes. However, Soviet propaganda used it to depict New Soviet Man, spreading ideas and slogans on the walls of buildings all across the USSR. 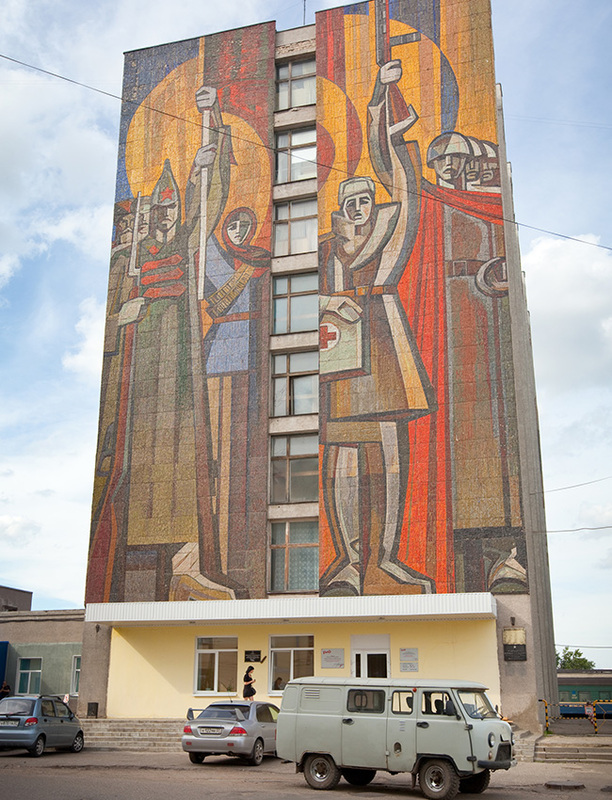 In the 1970s-80s new buildings in the Soviet Union were often decorated with mosaics. Schools had mosaics with perfect pioneers, sports centers with Olympic medalists, and factories with happy workers. 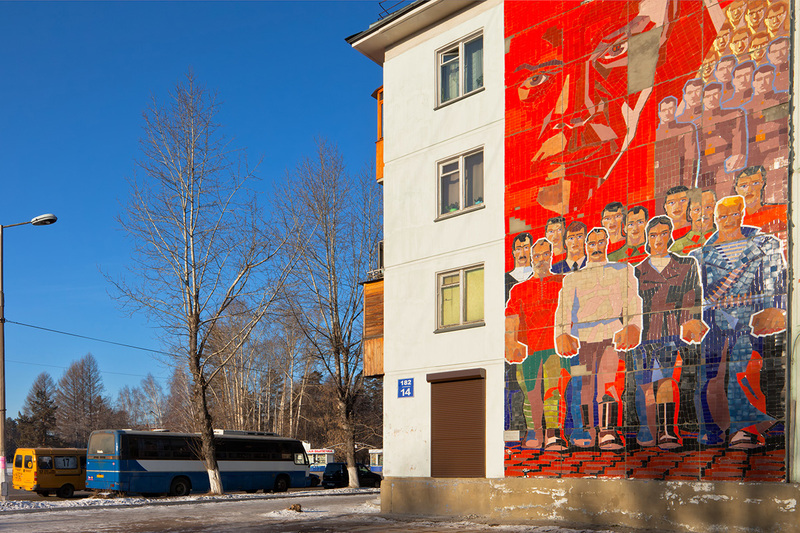 Mosaics on ordinary apartment blocks were often dedicated to the history of Communism and Vladimir Lenin, depicting people of every age and gender as the builders of Communism. / Angarsk city. "The Motherland Calls" was the main image of Soviet propaganda during the Second World War, and in the post-war period it was turned into a gargantuan statue in Volgograd, commemorating the Battle of Stalingrad [the city was renamed in 1961]. This time, the image is used with a quote from Lenin: "All power to the Soviets, land to the peasants, peace to the people, bread to the hungry." / Angarsk city. In Soviet times, mosaic art was funded generously. There were murals 8 storeys high. / Red Army soldiers, a female worker, a doctor, and WW2 soldiers on the wall of a railway station in the city of Ivanovo. A "We build Communism" mosaic on the wall of a building in central Moscow. Descending into the Moscow Metro, you will see plenty of Soviet mosaics. 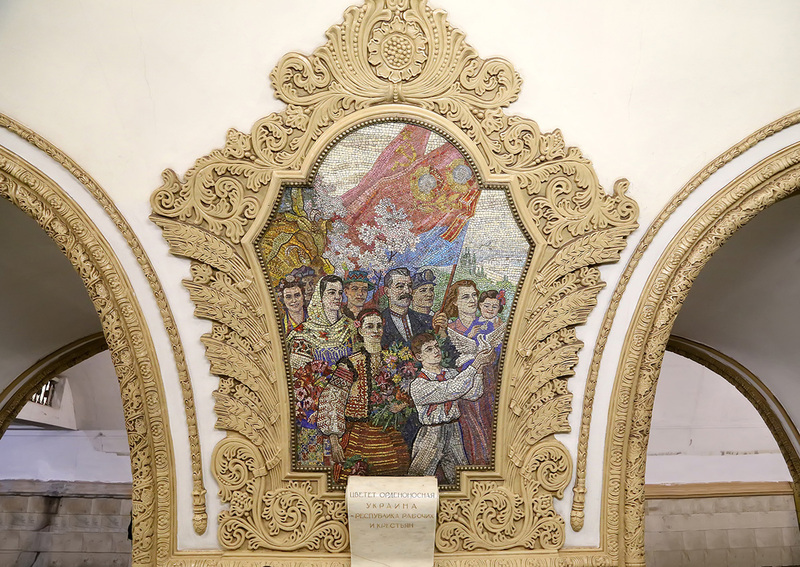 Mosaics are on view at Kievskaya station on the Circle line (pictured), capturing happy people with Soviet flags, a pioneer, and a dove symbolizing peace. You can also find mosaics at Mayakovskaya, Belorusskaya, and Chekhovskaya stations in Moscow. 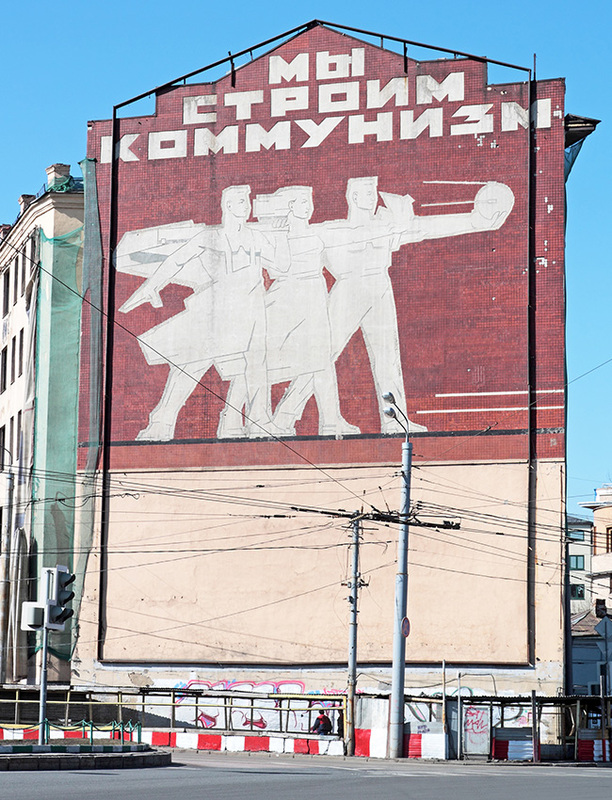 And in St. Petersburg, the walls of Electrosila station (pictured) display another quote by Lenin: "Communism is Soviet power plus electrification of the whole country." 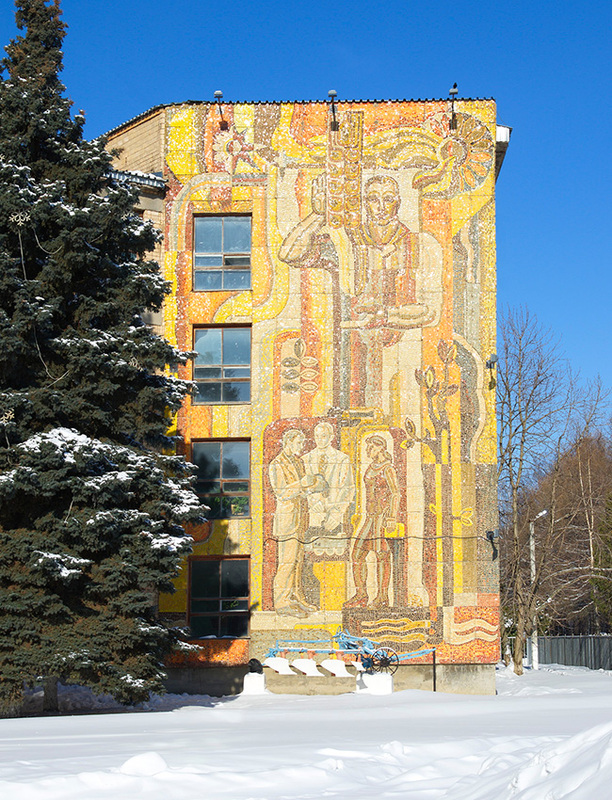 Some mosaics glorify Soviet workers, scientists, miners, steelworkers, milkmaids, and (later) cosmonauts. / Mosaic on the wall of an agricultural college in the village of Novosin’kovo. 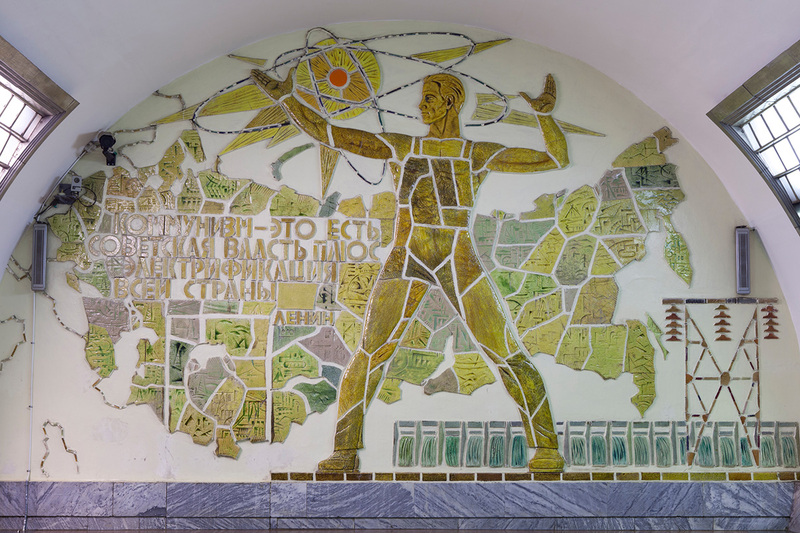 A large, bright mosaic uniting the symbols of science, knowledge, and the Soviet Union can still be seen in the assembly hall of Moscow State University. 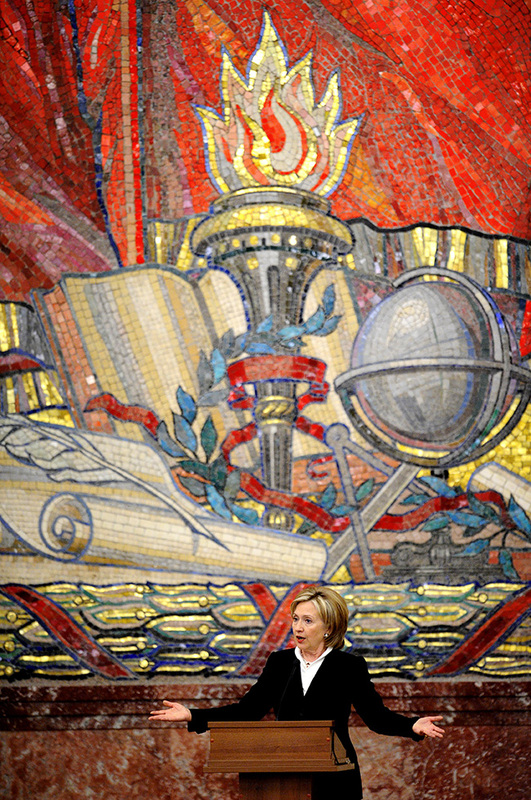 Ceremonies for students graduating with honors are held here, as are meetings with important guests – for example, Hillary Clinton. 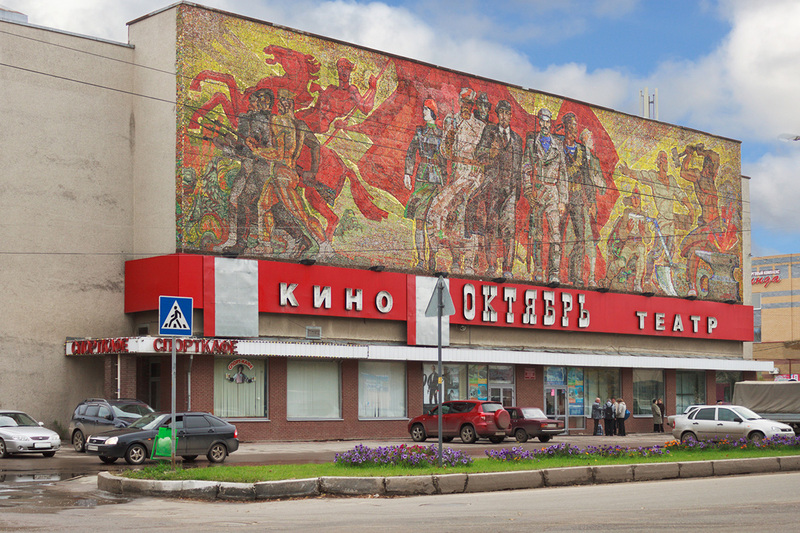 Many Russian cities still have Soviet-era movie theaters. It is often called "Oktyabr" (October) after the month of the 1917 revolution. 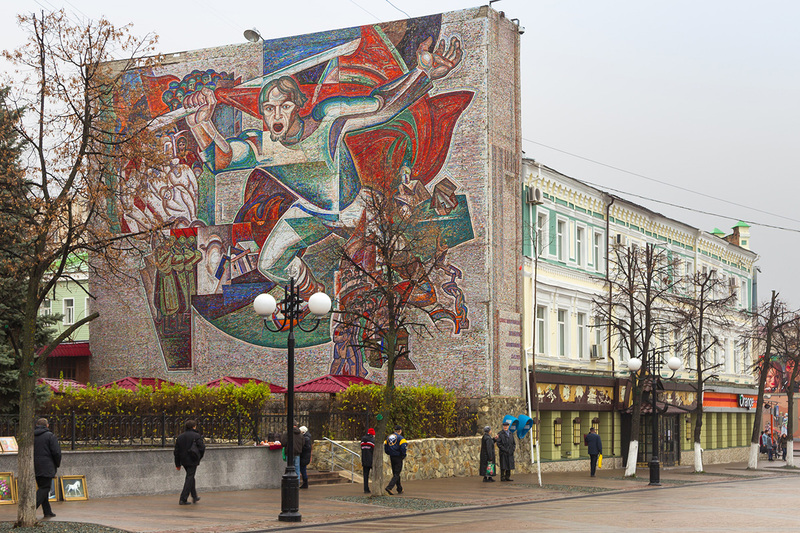 The cinema in the city of Bor (pictured) is decorated with a massive mosaic depicting Lenin, Red Army soldiers, and workers marching towards the "bright future of Communism." 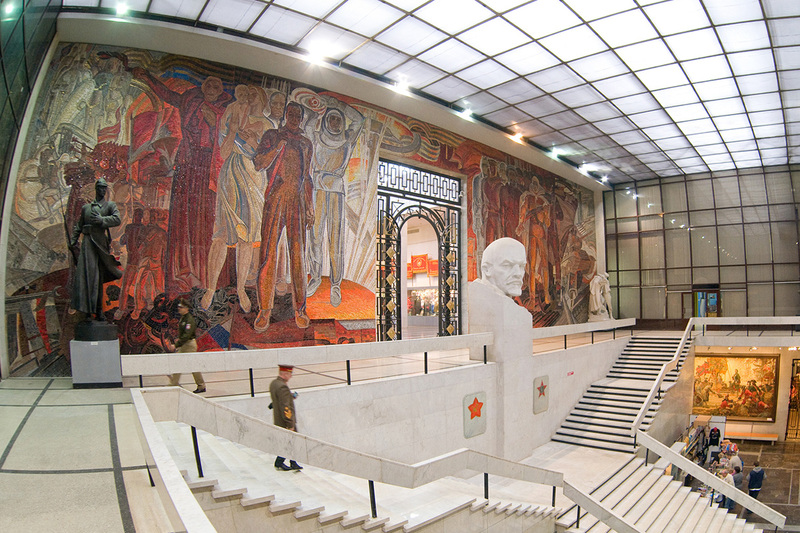 The interior of the Central Armed Forces Museum in Moscow, which was called the Museum of the Soviet Army before 1993. Located on Soviet Army Street, it still has a strong link to Soviet times. 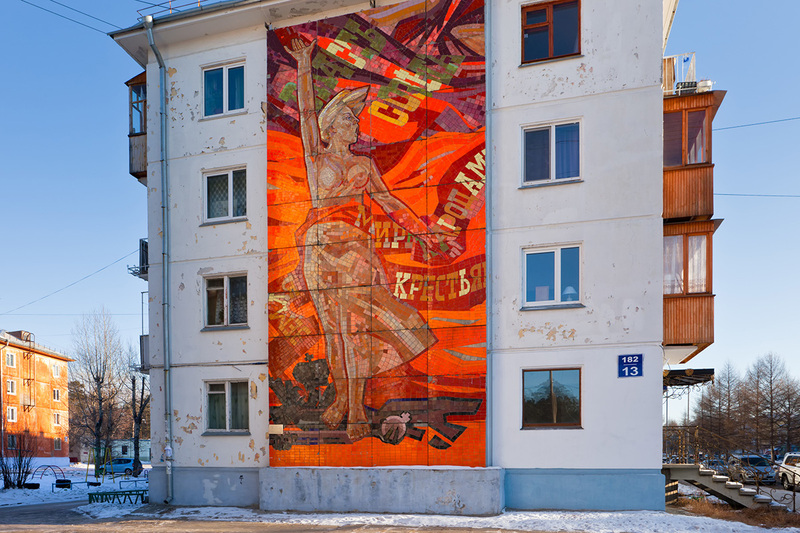 Mosaic of a worker fighting for Communism and bearing a red flag. Penza city.